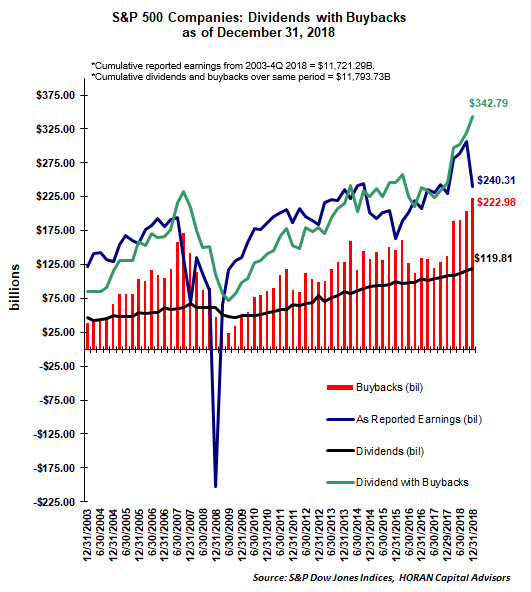 The level of buybacks provided a tailwind for earnings growth in the fourth quarter as well as the entire calendar year 2018. S&P DJI notes, "the percentage of companies that substantially reduced share counts of at least 4% year-over-year rose to 18.8% (90 total issues), up from the prior quarter’s 17.7% (88 total issues) and Q4 2017’s 15.1% (70 total issues.)" The four quarter buyback plus dividend yield equaled 6.0% in Q4 2018 and up from 4.75% in Q3 2018. Apple (AAPL) led in buybacks, spending $10.1 billion in Q4 2018, down from $19.4 billion spent for Q3 2018. Its Q4 2018 expenditure ranked 19th highest historically; for the year, Apple spent $74.2 billion on buybacks, up from 2017’s $34.4 billion; over the five-year period the company spent $229.0 billion, and $260.4 billion over the 10-year period.